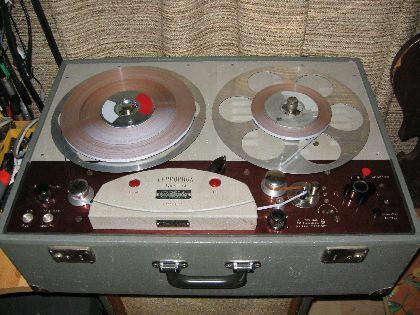 This tape recorder is a latter machine, then the other one in the previous picture, from early 1950s. This type is the most riped version, with 3 tape speed. Worthy of note, the construction has built in a "trunk", and the amplifier and the loud-speaker has built in another trunk. This conception can be seen at the first open-reel tape recorder, the AEG K-0 (Koffer) Magnetophon, too.